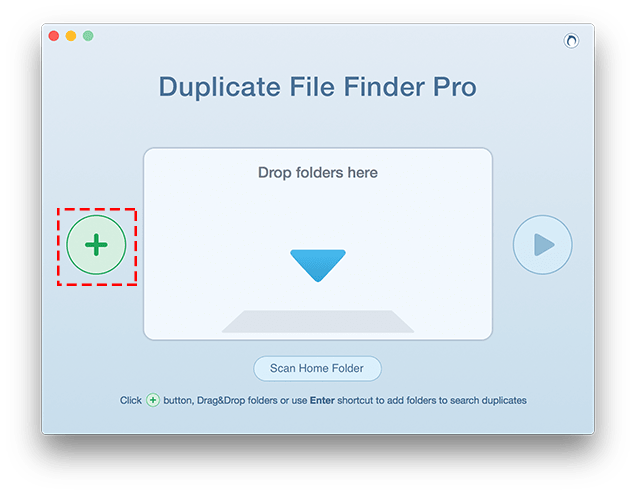 Duplicate File Finder allows you to quickly locate and remove all duplicate files and folders on a Mac. 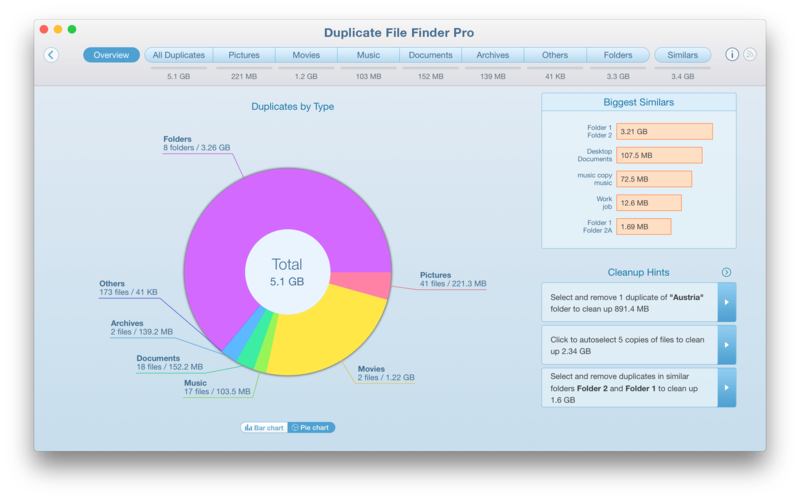 Most users don’t even realize how many duplicates they may have on their Macs. 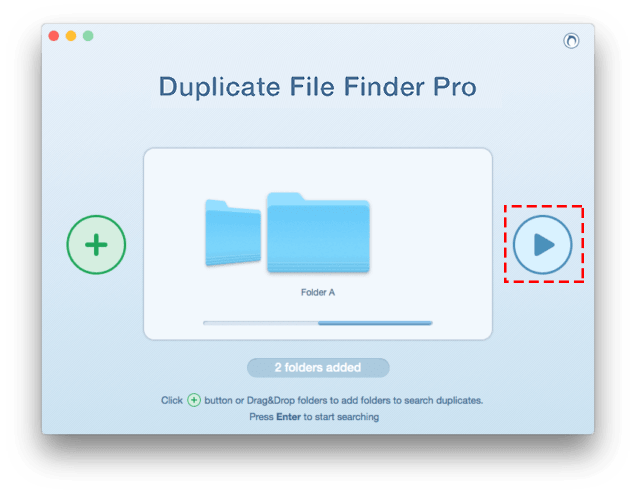 Here is a step-by-step user guide that will help you to get started with Duplicate File Finder easily, and clear useless repeated data from your disk. Download the application from Mac App Store. 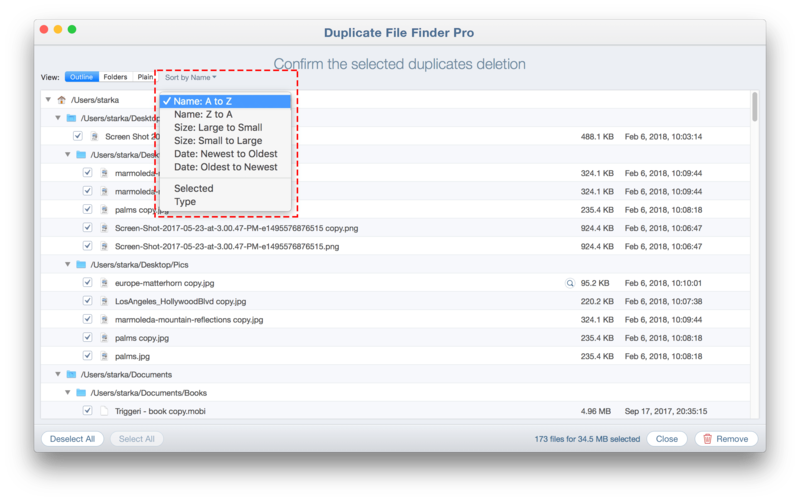 Launch Duplicate File Finder from the Launchpad. You will see its initial window for choosing which folders or drives should be scanned. 3. Click the green button on the left to choose folders from the Finder. 4. Click the blue button on the right to start scanning the folders. 5. 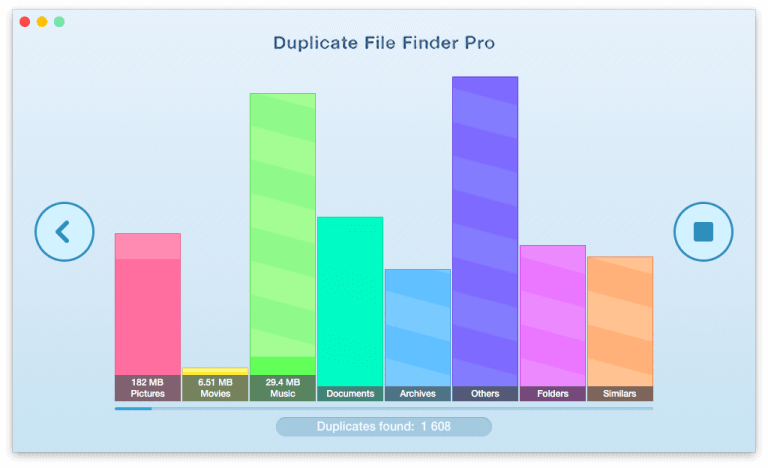 During the scanning process, you will see an animated bar chart that represents found duplicate files and folders in real time. Wait until it finishes searching for copies. 6. When the application completes checking the folders for duplicates, you will automatically be switched to the screen with an overview of summary results. You can review them in Bar Chart or Pie Chart mode. Here you will also find a section with smart cleanup hints and a list of the biggest Similar folders (if you have them). 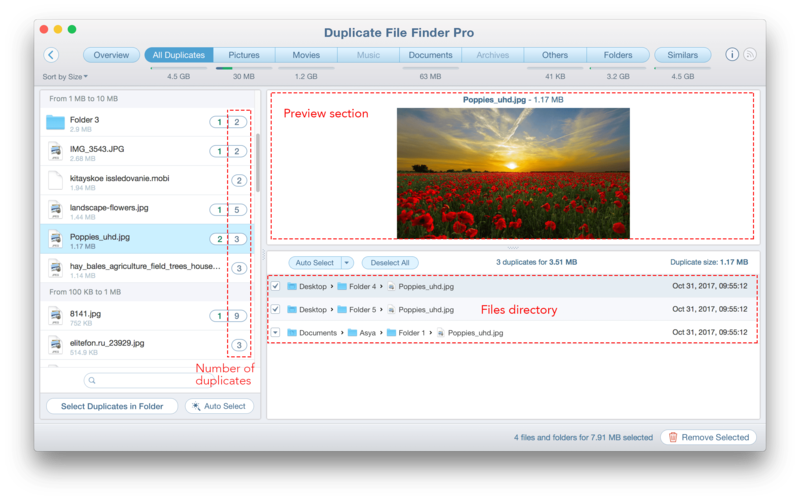 Note, these options are available only in Pro mode of Duplicate File Finder. You can switch to any category from top Menu tabs (Pictures, Movies, Music, Documents, etc.) for a detailed review of duplicates by file types, or go to All Files tab where you will see all found duplicate items. 8. In each section, you can preview the duplicates, see where they are located and how many identical files they have. 9. Review your duplicates and select unneeded ones for removal. For this, tick the checkboxes near the duplicate. In the left section a list of selected files will appear. After the duplicates selection, click the Remove Selected button in the bottom right corner. Also, you can sort files by name, size, date and type. Preview the files in a convenient for you mode and confirm the deletion by clicking the Remove button. That’s all! You have cleaned up your external drive or Mac of duplicate files and folders. If you still have questions related to the application work, visit our Help page and FAQ or contact our support team. We will be happy to assist you.